time for Intruction and time for condition. while the time for display of instruction depends on real time. which are sometimes difficult to calculate. Thanks for uploading and creating this program. This small program must be quite useful when making cut scenes. This is quite helpful, thanks for submitting this. Agree with the others. Can't believe someone hasn't already submitted something like it. Oh, and you spelled it "imput" rather than "input", but I've seen hundreds of examples of that in programming, so it's no biggie. Anyways, yeah...I need this tool and will download immediately. 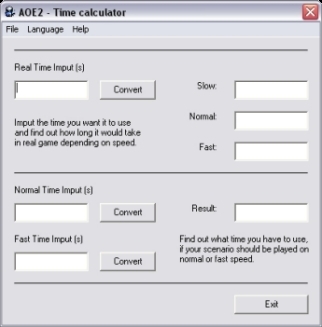 The AOE2 Time Calculator is a simple program that does what it sais on the package: calculates time. More precisly, it converts real life seconds into game time seconds, for all three speed settings. The program itself is very simple and free of bugs. It also comes both in English and Czech which might be useful for some. The layout is simple and effective, nothing more than the calculator, and it has no weaknesses. How useful is this tool? Well, it could be useful when you design cut-scenes or other scenarios where timing the dialogue and music is important. If you have a lot of dialogue it will probably be very tedious to always get out of the editor and check with the calculator, and at least I would just go by heart onsuch occassions. When it comes to checking the length of music pieces though, it might come to better use. All in all, a neat little tool, with limited usefulness. When you really do need it though, it's great to have it there. Magor Willi's Time Calculator is the perfect tool for scenario designers who need to work out the difference between the speed times in AOK against real time. It is sometimes very difficult to workout the timing in AOK as the in-game seconds are actually quicker than real-time seconds. This utility is perfect for designers who wish to time their triggers to the time. it is especially useful for people who need to trigger music and sound effects to come on at a certain time. I have used this tool loads of times and I have found it incredibly helpful. This is the perfect tool for designers, and particularly designers who use a load of cinematic cutscenes in their scenarios. The program itself is very self-explanatory and user friendly. Simple but effective. Sometimes it can be a little difficult to figure out the exact time the calculator is giving you depending on what timings you are trying to figure out but with a bit of trial and error you will soon get past this and work it out. Overall I think this is one of the best programs for an AOK scenario design, only really behind Trigger Studio, AGE and Turtle Pack. I couldn't recommend this program enough!